Located just 40 miles northwest of Chicago, Barrington is a small village in Cook County. With just over 10,000 residents, the Village of Barrington offers a hometown feel and sense of community, while still providing plenty to do for residents and visitors alike. With 40 different restaurants, over 100 shops, and the largest residential historic district in Illinois, Barrington is a popular choice for small business owners looking for a sense of community. The Village of Barrington boasts the motto of “a great place to live, work, and play!” The Chicago suburb also hosts a variety of community events throughout the year, such as Barrington Art Festival, Scarecrow Festival, Barrington Brew Fest, and the Great Taste Fest of Barrington. The Village Center serves as the “hub of activity” for the surrounding villages in a 90-square mile radius, including: North Barrington, South Barrington, Barrington Hills, Lake Barrington, and Tower Lakes, and Hoffman Estates. The Metra train stops in the center of the village, providing easy access to Chicago to residents of the Barrington area. This close proximity to the city makes Barrington the perfect choice for commuters who still want that small town feel. 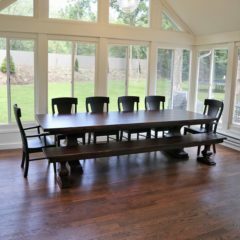 Operating out of our showroom in nearby Joliet, IL, Rustic Elements Furniture provides custom furniture to the residents of the Chicago area. 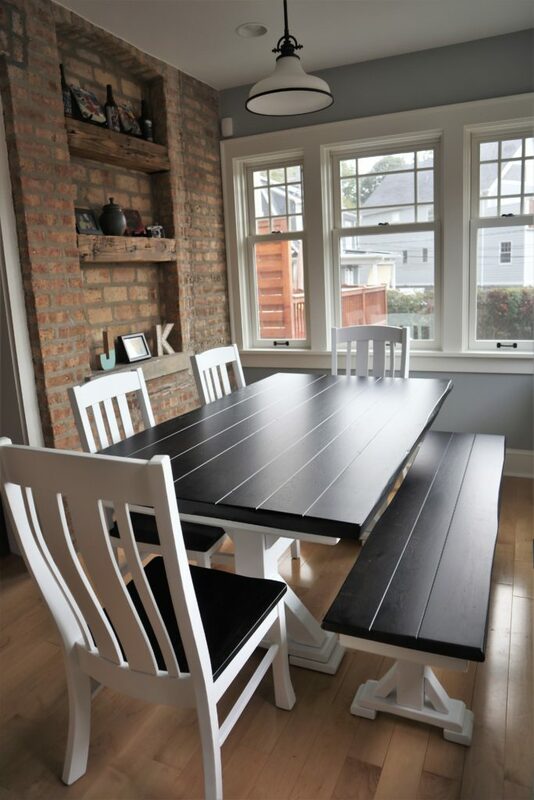 Since 2001, we’ve built custom tables for customers throughout the Chicago suburbs, including Barrington. 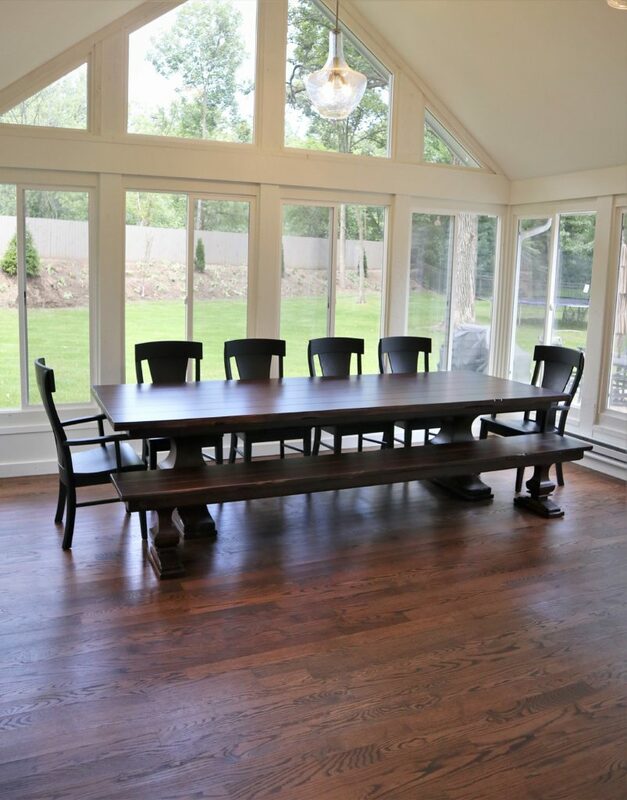 We pride ourselves on using only the highest quality wood available, and each of our tables are finished with an imported commercial grade finish, making them dent and scratch resistant. Our furniture can also stand up to common chemicals, such as bleach, nail polish, and cleaning products. At Rustic Elements, we understand that a new piece of furniture is an important investment. That’s why we work with you every step of the way to bring your vision to life with a piece of furniture that is completely custom. We leave all the important decisions up to you, letting you choose the style, type of wood, size, and color. While we specialize in custom wood tables, we also build a variety of custom furniture, including: buffets, media centers, benches, and island tops. If you don’t have time to wait for a custom piece to be built, we also offer ready-made furniture. Check out current inventory to browse all of the pieces we have available for immediate purchase. 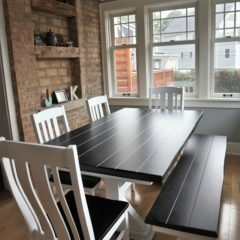 If you live in the Barrington area and are searching for a piece of custom furniture, contact Rustic Elements Furniture today!